Convenience, style and innovation converge with Kwikset’s SmartCode 916. This Zigbee or Z-Wave enabled touchscreen smart lock revolutionizes door locks with industry-first innovations and the flexibility to work with a variety of security and home automation systems. 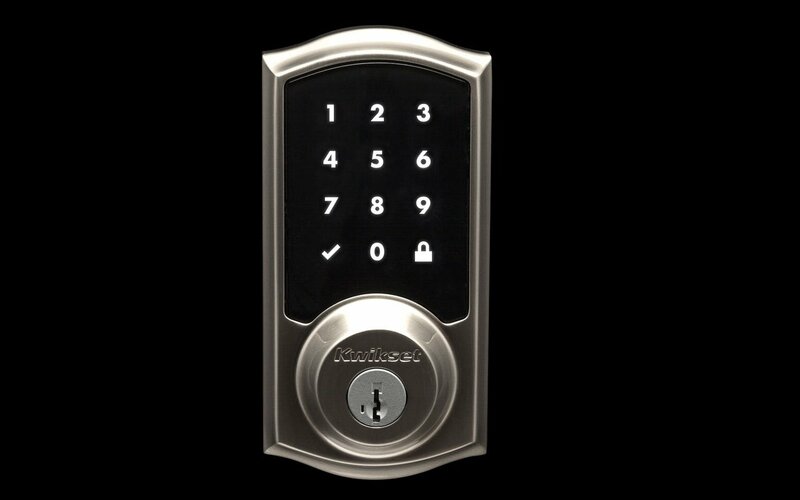 The sleek, slim touchscreen deadbolt features Kwikset patented SecureScreen technology and SmartKey security. SecureScreen technology helps prevent “smudge” attacks, a common problem with touchscreens locks. SmartKey security protects against common break-in techniques like lock picking and bumping. Additionally, SmartCode 916 offers an Auto-Lock feature that automatically locks the deadbolt after thirty seconds, helping prevent unauthorized entry. SmartCode 916 seamlessly integrates with a variety of home automation systems through the Zigbee or Z-Wave wireless protocols allowing builders and homeowners the flexibility to choose the system that’s right for them. Homeowners can remotely lock or unlock their front door or set rules to trigger other smart products in the home when the door is locked or unlocked. Imagine unlocking the touchscreen deadbolt, opening the door and the lights turning on without having to flip the switch, or triggering the thermostat to auto-adjust the temperature with the lock of your door to cut down on energy use while you’re away.